Star Trek-Scrabble: how do you spell word game in Klingon? The Starship Enterprise has now crossed over to one of America’s favorite word games! Now with Star Trek, Scrabble is better than ever: meet Star Trek-Scrabble . Combines Star Trek and Scrabble for hours of fun play. America’s favorite crossword game is setting the alphabet to stun with Star Trek-Scrabble Collector’s Edition. It has the same great Scrabble play plus an exclusive Star Trek dictionary and rules that help you gain bonus points. Earn Tribble Word Scores, consult a Klingon dictionary and boldly go where no one has gone before. Includes board, tiles, tile racks, logo inserts and instructions. Includes 50 word bonus dictionary. A good idea for upcoming Father’s Day (remember, it’s on June 21st)! 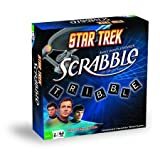 Star Trek-Scrabble retails for just $28.46! You are currently browsing the archives for the Board games category.